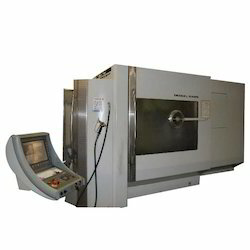 One can avail a wide assortment of Automatic CNC Machines from us at market leading prices. 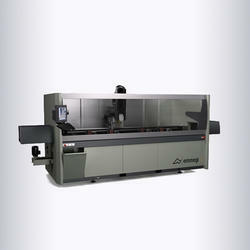 Automatic CNC Machines are available in different sizes and dimensions. The Automatic CNC Machines are extensively used in manufacturing in its earlier sense, referring to automated lathes of non-CNC types. Turning length : 500 mm Turning diameter : 520 mm X-axis : 225 mm. Spindle taper : ASA 6. 1.4 pieces Japan THK guide rails are mounted on Z axis. Box type construction and temper stress relieved, ensure Z axis good rigidity and stability during working with high speed on curved surface. And it is equipped with dual pneumatic counter balance cylinder which allow high accuracy and stability. Since 1975, we are acting as dealer in used machines. We can source used machines from Europe, USA, Japan, Korea, Taiwan and other location world wide and also do installation and commissioning for you including re-conditioning if required. table size. : 1830mm x 3048mm, table capacity: 22.7 tons, distance between columns. : 2133mm max. 5-axis CNC machining centre designed to mill and drill bars or workpieces made of aluminium, PVC, light alloys in general and steel. - Guided by computer-aided design (CAD) system to achieve machines optimum structural design. Machine adopts reinforcing aluminium alloy construction, box structure and thick-walled. Strengthening ribs are welded inside. These make machine have excellent rigidity. We also offer 5 Axis Machined Components as per customers requirements & specification which are highly used in various industry like Aerospace, Automobile & etc.